The Shangpa Kagyü (Tib. ཤངས་པ་བཀའ་བརྒྱུད་, Wyl. shangs pa bka' brgyud) school was founded by Khyungpo Naljor (1002-1064) who was prophesied by the Buddha. He made his seat in a place called Shang in the Tsang region of Tibet. 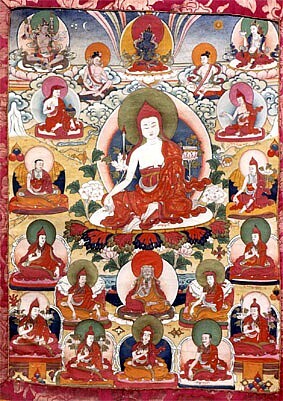 He was therefore known as the Lama Shangpa and his lineage the Shangpa Kagyü. Thangtong Gyalpo and Jetsün Taranatha were among the great masters who upheld this lineage, which is one of the Eight practice lineages. In the 19th century, when the lineage was almost extinguished, the great masters Jamgön Kongtrul Lodrö Thayé and Jamyang Khyentse Wangpo gathered together the transmissions of the different branches and gave renewed energy to the lineage. Kalu Rinpoche and Bokar Rinpoche were the recent heads of this school, and founded a great number of centres in the West. Matthew Kapstein, “The Shangs-pa bKa'-brgyud: an unknown school of Tibetan Buddhism”. In Studies in Honor of Hugh Richardson, ed. Michael Aris and Aung San Suu Kyi. Warminster: Aris and Phillips, 1980 pp. 138-144. Nicole Riggs, Like an Illusion: Lives of the Shangpa Kagyu Masters, Dharma Cloud Pr, 2001. Timeless Rapture: Inspired Verse of the Shangpa Masters, compiled by Jamgon Kongtrul Lodro Thaye, translated and introduced by Ngawang Zangpo, Snow Lion, 2003. Ringu Tulku, The Ri-me Philosophy of Jamgön Kongtrul the Great (Boston & London: Shambhala Publications, 2006), pages 143-146 & 180-182. This page was last edited on 14 May 2018, at 04:04.